That was my hashtag yesterday. My Tyler, age 19, started the Correctional Academy with the Riverside Sheriff's Department. It's been his dream since high school to become a law enforcement officer. Finally the time has come to start that journey. Actually, the journey started last summer when he tested for the job and passed the Physical Agility Test and then the nearly year long background to hire process. He leaves the house before I'm even out of bed. Before Emma is even out of bed (and that's saying something!). The drive from my house to the Academy isn't that long by BFE standards, it takes about 35 to 40 minutes to get there. And then there's the running, and the Tact Staff screaming, and the push ups, and the sit ups, etc. His class has already seen two people quit on the first day and one person at the hospital for injury. He came home last night tired. I enjoyed hearing the things he had to tell us about his day in his slow exhausted overused voice. All the "Sir, yes Sir's" and his voice was so rough. He may not have a voice by the end of the week. He walked in the door too tired to eat dinner and said that once he went upstairs he wasn't coming back down! Haha. When he finally went upstairs, I was a tad worried he'd lay down on his bed and be out for the night. We did have to re-shave his head. He shaved off all of his beautiful hair on Saturday, much to my mother's dismay, using the #2 guard on the clippers. He looks so different. I hadn't seen him like that since his junior year of high school. His hair was just gone. Haha. Anyways, he was told that his hair was too long so I shaved it using the #1 guard last night. Even balder! It's been decided that his head will be shaved every Thursday night so he'll be clean for Friday inspection. I do need to say this, Tyler has the two best dad's. Tim was perfect for him growing up when he played baseball. He's an amazing coach and Tyler thrived in baseball because of him. Now that Tyler is on to his next journey, he has Wade. Wade's guidance is so valuable right now and Tyler will benefit because of it. Which brings me to my next picture. Previously being a baseball family and never having any reason to wear shoes that needed polishing, Tyler was never taught the skill. Thanks to the United States Marine Corps, Wade is a master. 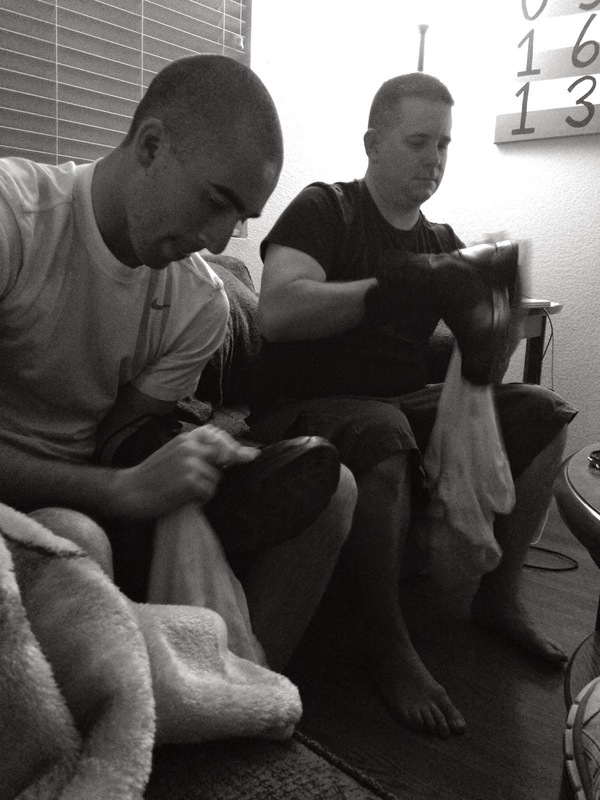 It was so fun to sit and watch Wade teach Tyler how to shine his shoes, which has to happen every night. It's a good thing I like the smell of shoe polish. This is my new favorite picture for so many reasons. It's going to be a long 10 weeks for Tyler and I just know they'll fly by for me and my baby will move out and on to his new life and career. I'm excited and not at the same time. I'm just going to enjoy him under my roof for as long as I can keep him.